― If Junsu is already 25 years old? 3 years from now. Personally, I want to get married. 25 years old, being Dong Bang Shin Ki. I want to own as many things in life and there are a lot I want to achieve. But above all, I want to be an adult. ―Junsu being an adult, right now I can’t imagine it at all (laughs). Okay! Three years later, I will surely turn into a real man! ―If Junsu doesn’t change, it will be difficult to avoid the tease from Changmin (laughs) *. Eventhough it’s difficult. I will try! ―So Junsu really wants to grow up so fast, huh? There is some part of me that want it to, while the other is not really. Ah, yes, but I also want it to be. I think, men in their 30s is just like in a game. How faithful are you next in your 30, depends on how you take care your 20s first. Your 20s is like a preparation period for you to overcome your 30s. You want to play a lot, but there’s limit. So, facing a lot of challenges with efforts right now, it’s like a price for finally enjoying what you’ll get in your 30s. In the 20s, towards your 30s, you’re in a position where you can achieve any goal, and when you can also change dramatically. ―Now it’s the first time Junsu looks so mature (laughs). I thought Junsu who just said such things like that wasn’t the same person. I mean, it’s somewhat painful but I’m fine. ―So, that means, it might not be a bother. Eu kyang kyang (laughs). Anyway, I will try anything! 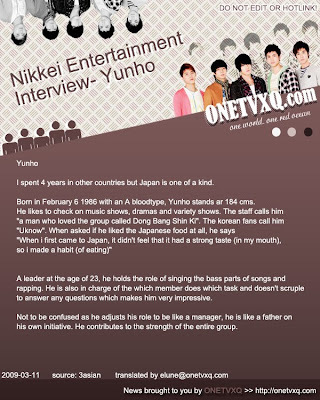 ―Yunho when he is 25 years old, what does he want to be? Greece, Las Vegas, Bora Bora, Maldives…….. I really like those countries, hence I want to visit them. I have not yet seen Greece but from pictures, I think it is very interesting. ―That’s the country of history. Let say you have some time, then how long will you need to take the trip? I need more than 1 month. ―As a Dong Bang Shin Ki, how can you believe that you will have such a long vacation? Somehow I have to. I’ll try to, staffs, please let me to (laughs). ―So it will be a private travel, not for work? Of course. Even it’s fun to go with friends, but if possible I want to go alone. ―Travelling alone, that must be something special. I don’t want to go as Dong Bang Shin Ki’s U-Know Yunho. I want to travel as an ordinary human, as an ordinary man. ―So being a simple tourist or just simply relax, it’s a trip where you can reveal yourself and not necessarily hide your face. Yes. Some people takes this idea wrongly, they think that I’m just too full of myself. However, despites my busy life, I want to regain the feeling of what actually I want to do, I want to confirm that to myself once more. ―It’s so important if you keep running (for your dream), but there are times when you just want to stop for a while. No matter how tough you are, sometimes you can become so weary. In fact, I still think that now is the time for me to keep running in full speed. However, whenever I lost my energy, I’ll do this travel thing. Power could properly be charged at that time, and it will influences myself in the future as well, I think. His English proficiency comes from the fact that he studied school in America. One would never have imagine such a husky voice that can be sung in Korean, Japanese and English (including rap) could come out of such a warming face. This particular husky voice is what makes him unique in the group. During live performances or at awards ceremonies, there are times when he tears but sayings like “he’s a real man” and “he’s got that cute aspect but you can still feel his manliness” continue to revolve around him. It is this characteristic that attracts and throbs the hearts of many Japanese women out there. “I was so excited to go to Japan for the first time that I hadn’t thought much of anything – I only took a few CDs; I didn’t even take my laptop nor set up roaming for my phone. It was only when we arrived that reality slowly hit me (laughs). “None of us were able to speak Japanese, so we were never able to express our feelings. Every day I had thought of wanting to go back to Korea, but slowly the live music/performances started to appeal to me in Japan. In Japan, you’re truly able to feel the communication between you and the audience with live music. “Even though in Korea we got to perform at the biggest venues performing the biggest and coolest performances, in Japan we loved singing to small audiences, who enjoyed our songs quietly. That was a difference between the audience in Japan and the audience in Korea. But nevertheless, the realisation of us being known in Japan was something that we could’ve never imagined. Now is the momentum of these 5 members vocal group TVXQ! The end of 2008 was their debut record at festival award (T/N: Kouhaku Uta Gassen), just like a fire, they increase television exposure everyday! Many people got caught up in their talent and charm. The first single from their 4th album, “Survivor” is Limited Edition! It’s pretty hard to live in this modern society, yet Survivor encourages to force ourselves to stay alive! 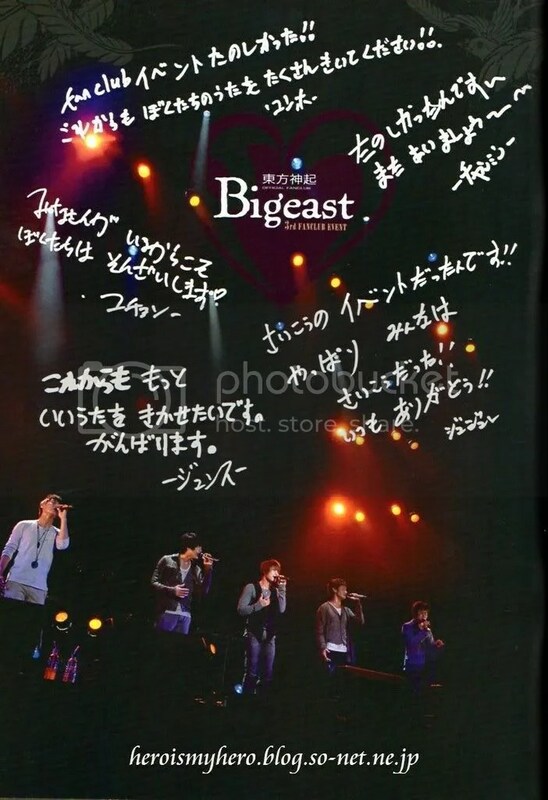 TVXQ’s song is so rare, a song of message to modern society. 4th Album “The Secret Code” 2009.3.25 Release!! Included also in the album, their 2009 first single “Bolero” which is a work-packed and high quality vocals that is overwhelming! Don’t miss this big album!